Upgrade your security with the new and improved Ring Doorbell 2. Works with any home. Wireless doorbell can be mounted anywhere. Instant alerts when visitors press your doorbell. Wi-Fi connected from up to 9.1m away from your router. Infrared LED night vision up to 4m. Wide 160 degree viewing angle. Flashing light when door bell is pressed. Includes quick release rechargeable lithium battery. Interchangeable satin nickel and venetian face plates. Remote viewing via Smartphone, tablet or PC. Ring	The Ring Smart Video Doorbell 2 is a wireless video doorbell that sends instant alerts to your Smartphone, tablet or PC when the doorbell is pressed. The doorbell includes high quality HD 1080p video footage with night vision, so you can see who's at the door, day or night. The built in camera includes motion detection technology which will alert you if somebody is at the property and you can view live high definition footage at any time. You can even hear and talk back via the built in microphone and speaker. The Ring Video Doorbell connects to your home broadband from up to 9.1m away from your Wi-Fi access point and can communicate with an unlimited amount of smart devices with the Ring app installed*. The doorbell includes a rechargeable lithium battery but can also be hard wired or connected to your existing doorbell wiring. The Ring video Doorbell 2 is fitted to the outside of your door. The doorbell includes a push button and integrated microphone, speaker and camera allowing you to see, hear and speak to guests from your Smartphone, tablet or PC. The Ring Video Doorbell 2 is powered by one rechargeable lithium battery which can be easily removed and charged with the included micro USB charging cable. Mounting Bracket, Micro USB Charging Cable, Instruction Manual, satin nickel and venetian face plates, Installation Screws and Fixing Kit. 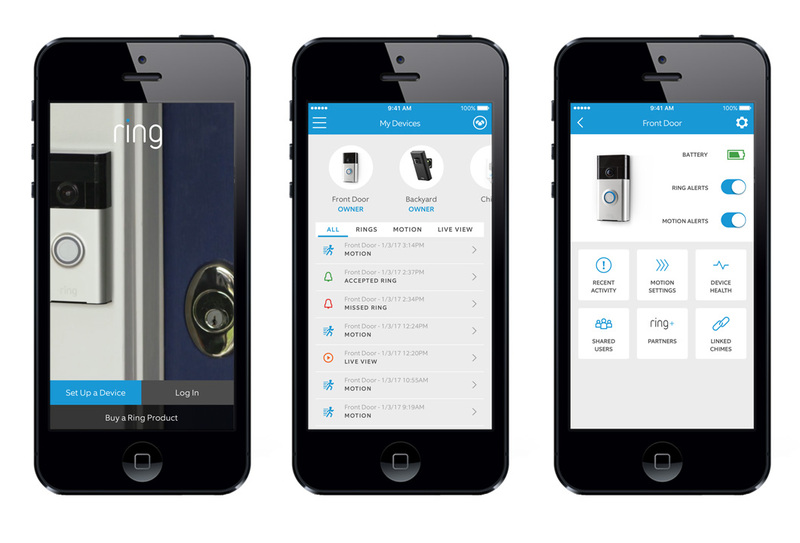 It is easy to view recorded and real time images from your SmartPhone or Tablet using the Ring app* (available for iOS, Android and Windows) providing your Ring video Doorbell 2 is connected to your internet router via Wi-Fi. The integrated camera allows you to view high definition HD 1080p footage so that you can see who's at the door. You can view live footage at anytime via the Ring app and the camera includes motion detection technology which alerts you when movement is detected. The camera also includes LED night vision video from up to 4 meters away providing crystal clear footage any time of day. You will receive a 30 day free trial of Ring's cloud storage feature which allows you to view recorded footage. A subscription is available for further access with monthly or yearly subscription plans available which allow you to view up to 60 days worth of video recordings. You can however, still use the Ring Doorbell 2 and receive notifications without a subscription. The Ring Video Doorbell 2 includes a rechargeable lithium battery which can be recharged with the micro USB cable which is included. A low battery indicator appears via the Ring app to let you know when the battery needs to be charged. Alternatively, you can hard wire the doorbell in to your mains electric or connect to your existing doorbell wiring.